Bastian Sascha Schmidt: "The end product exceeded my expectations by far"
"Valentina was such a pleasure to work with. I have an acupuncture practice and needed headshots as well as shots of my clinic. I'm so glad I chose Valentina for the job. She is very warm and welcoming, and she made a camera shy person like me feel very much at ease. The process of picking my favorite shots was very painless and the end product exceeded my expectations by far. I would recommend Valentina to anyone seeking a skilled and personable photographer and she gets my highest recommendation!" 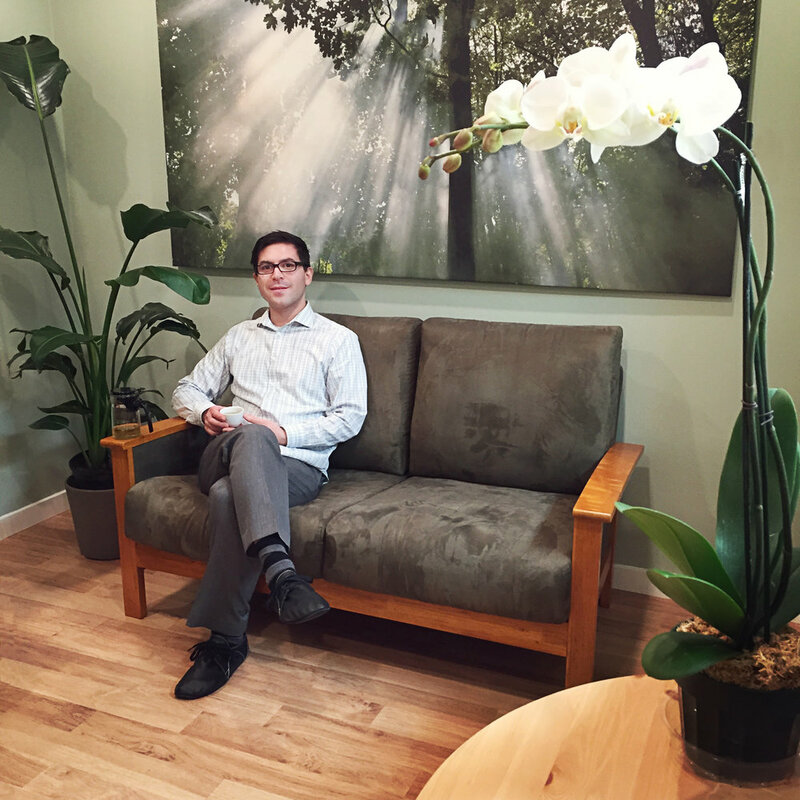 My name is Sascha and I’m the owner of Tree of Qi Acupuncture Clinic in San Francisco. My interest is in bringing health and healing into the world and I feel very grateful to be able to provide my services to the lively and diverse community we have here in the city. I focus on helping patients heal the underlying imbalances in their bodies and minds, thus creating what we call “flow” in Chinese medicine. Flow is what ensures movement that is free of pain as well as a state of mind that is free from suffering. With health costs on the rise and an emergence of many acute and chronic health concerns ranging from pain, digestive issues, women’s health, to stress, anxiety and depression, I believe that acupuncture and Chinese Medicine are valuable resources for people during this time, especially for those who’d like to take a more active role in their healing journeys. I use acupuncture, Chinese Herbs, cupping, reiki and nutritional counseling to help my patients find balance in their lives and I’m excited about what I do. Morning routine: I meditate for 20 minutes, then I have tea and listen to either NPR or a podcast. Recently I’ve been detoxing from politics (not always successfully), so I’ve been listening to spiritual talks. Worst habit: I binge watch TV shows if they’re good. Tell me about your choice to open your own clinic and become your own boss: what motivated you? What were your fears and challenges, and how did you overcome them? I’ve always liked the look and smell of Chinese Herbs and have been fascinated with Eastern Philosophies and ways of treating the body even years before practicing Chinese Medicine. I used to live in New York City and would go to Chinatown often to be immersed in the colorful world of Chinese food and herbs and products. How long did it take for you to get your business running the way you've always imagined it? In other words, how did you "get on your feet"? I started my practice out of my apartment, because I was operating with a very low budget. This was surely one of the biggest challenges in the beginning. However, within 6 months I moved into a nice big clinic space here in the Mission and today, almost 7 years later, I practice in a fully equipped 3 treatment room clinic. What do you enjoy most about your role in patient care? Being my own boss has been a wonderful experience. I set my own schedule, take 3 day weekends, travel, and I get to do what I love most, which is to help people feel better. A challenge of being my own boss is that I have to oversee all aspects of my business, even the ones that don’t come so easily, such as bookkeeping and marketing. For this reason, I hired a business coach, who recommended getting professional headshots. This is where Valentina comes in: she’s been an integral part in my public appearance - her images not only portray the true essence of who I am and what I do, but also the space and surroundings I practice in. Having a community of talented friends and colleagues around me has been key to the success of my practice. In order to balance the demands of running a clinic I take long weekends, and often I leave the city and go into nature. In my spare time I also like to play music, read, go on long walks, go on meditation retreats, do archery, and visit the many naturally occurring hot springs in California. What are some of your personal and/or professional goals for the future? A goal of mine for the future is to open up a tea house in the San Francisco, a place where people can come to relax and ground, a place of community and respite of the city hustle and bustle. A big part of my spirituality and inner growth is to make an impact on the community that lasts even after I’m long gone. It is my hope that my clinic and my future tea house will provide the community with resources for many years to come.